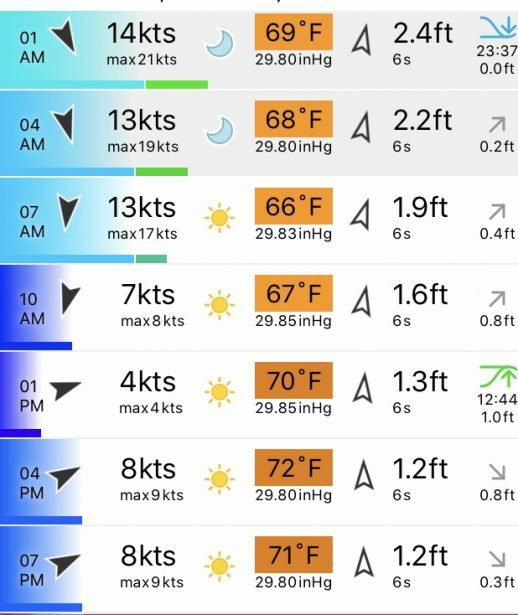 Weather does play a major role in whether or not you will have a flat calm or perfect day, a choppy but okay day, or we have to cancel the trip. If the sea conditions are less than 3 feet, most of the time we can go fishing. Even if it is forecasting rain, we still go as long as the seas are not too rough. If the weather and sea conditions are looking iffy, we will try to communicate with you in advance of your trip. If you do not hear from us, expect to show up on time at the boat or at the marina. This is the weather you see when you open your smart phone. This forecast is not accurate enough for fishing. For illustration purposes, in the picture below, the smart phone app shows us that on Wednesday at 7 am, the wind is supposed to be coming from the North at 13 knots, gusting to 17 knots. The seas are forecast to be from the south southwest and be 1.9 feet in height. The waves are 6 seconds apart. This means the wind and wave height are within our boundaries and we will expect to go fishing. This is the APP we use to determine the wind direction, wind speed and wave direction and wave height. These are more accurate for what we are doing. The picture below comes from the national weather service. 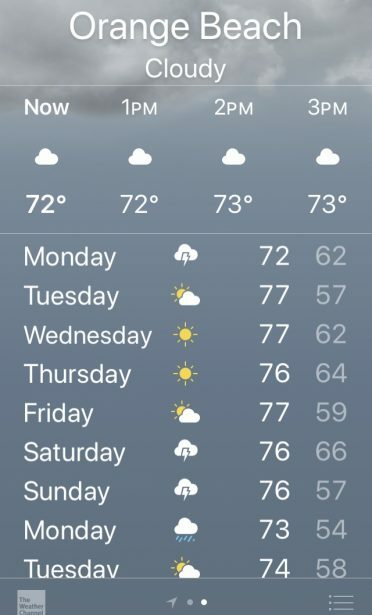 It shows almost an entire week’s forecast. We use these two forecasts and compare them with each other. If you look at Wednesday, it shows that they too are forecasting east winds at 1 to 2 feet. By comparing these two forecasts, we are able to make a better guess as what to expect from the wind and waves on the day you want to go fishing. 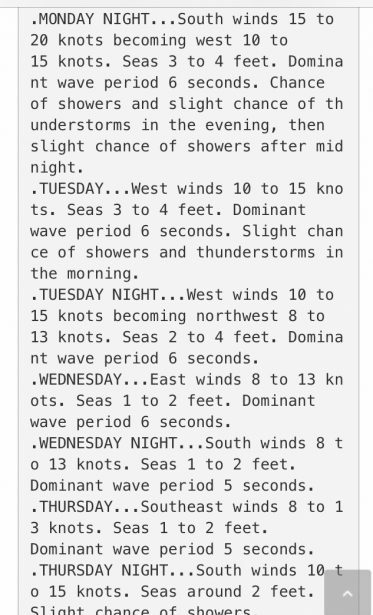 This is a marine weather forecast specifically for our area and out to 20 nm offshore. We hope every day is a beautiful sunny day and there is a gentle sea wind blowing in your hair. We always want the seas to be calm. Unfortunately, the wind and waves vary from day to day or hour to hour. If seas are 3 feet or less and the waves are 4 seconds apart, we will likely go fishing. The key to going is having the waves far apart as you can get them. A 3 foot sea and 6 second wave period is almost calm. It’s just a big swell and it’s safe and enjoyable to go. If the wind is blowing less than 20 knots, we generally plan on going fishing as long as the seas are not bigger than 3 feet. An average day is 10 to 15 knot winds and seas are about 2 feet. We hope this page helps calm your fears and let’s you know we will always do our best to ensure you have a good fishing trip. Be sure to read our policies page so you will find out how we handle weather and cancellations.